...are you watching me to see if I'm any different? In particular, I am referring to people who "knew" me before I became a person living with MS, and whom I don't see on a regular basis. So we cross paths at a gathering, and I wonder...does the other person look past me to see if I have a walking aid? Does he watch me walk across the room, and other than looking at my dazzling beauty and gorgeous jewelry, does he check for a drunk-like swerve or stumble? I suppose this kind of anxiety* (*for lack of a better word) is pretty common. But now, I have added to the list of imaginary things that people are checking me out for. 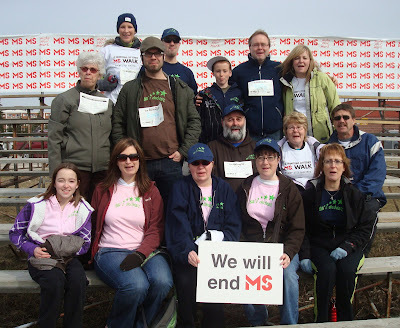 Every year, for the MS walk, free t-shirts are handed out to walkers who have raised a set amount of money. You pick up your t-shirt when you register on the day of the walk, or a couple of days before hand. For some teams, they get their team name printed on the back of the shirt. This is a "free" bonus for teams that raise, again, a set amount of money (the MS Society has the names printed, and the team captain has to pick up the shirts at the local Society office). Em's Slackers have never raised enough money for the "free" bonus. Or so we thought. We have never been contacted to pick up our shirts, and our pledge-watching-ways have shown us that we were never close. Or so we thought. *Ok, time for a bit of background information before I continue with this post...Jason's job has him traveling through the depths of downtown...the downtown of a large Canadian city. He sees many, many people in a day. So imagine his surprise when he sees a t-shirt that says "Slackers" on the back. Surprised he was, but not enough to come home from work and tell me about it. Until he saw it again the next day, on a different person, rummaging through a garbage can. But this time, he clearly saw the back of the brown t-shirt...Em's Slackers. Yes, Em's Slackers 2008 MS Society t-shirts are being modeled by Winnipeg's homeless. Em's Slackers: doin' it for MS and for a fashionable downtown core. Last night, while laying in bed, waiting for sleepy time to find me, I watched a re-run of The Hour. George's guest was Alanis Morissette. Searching for happiness is one thing, but not THE thing, as happiness is fleeting. The true search is for peace. I think that the MS society needs a new walk photographer, because my team is more photogenic than this! I feel like a zombie...a glassy eyed zombie. This business is getting me down, and I am sure that the crummy weather isn't helping any. This past weekend, I had a super mini meltdown over my lack of energy and enthusiasm, which is kind of dumb, because a melt down requires energy. I was reminded that I have had a busy few weeks, and this zombie time is to be expected. Today, out of sheer stubbornness (not to mention a phone call from the gym commenting that they haven't seen me since May 15) I snatched up my gym bag, and drove to the gym. Dumb move. The road to the gym is a long street, with a whack load of stop signs. When I'm glassy eyed, I don't tend to pay attention to street signs, or turn my head both ways to look for other cars. Anyway, I arrived safely (and I think that everyone else that I left in my wake, also arrived to their destinations safely), only to find the gym closed! Part of me was thankful, because I didn't know what I was going to get out of it, if I had no energy to put in to it...but the other part of me was angry. Anyway, their hours of operation isn't the point. The point is, I shouldn't drive down residential streets with eyes glazed over. I know enough not to drive down main streets with lots of cars...now I know that no level of driving is safe when I am in zombie mode. So why am I sitting here...fighting an impending nap? Connected to that idea - how do you make friends when you have MS (or any chronic illness) - is when and if you should disclose your medical situation. This has repeatedly popped in to my mind lately: whether I'm reading a magazine that has an article on the exact subject, reading comments on my blog, or struggling with my own "I don't work because I have MS" situation. Let me say this very quickly - I don't think that there is a correct answer to this. But boy, is it ever a difficult thing. New friends, old friends, family, employer, future employer, neighbour...who needs to know? For myself, disclosing this information to close friends and family was a no-brainer. Disclosing to my employer was a different bag, because I quickly became unable to work. I felt as if I owed my employer an explanation, but at the same time, didn't want to provide him with any reason to terminate me. Which lead me to worry about job hunting for the rest of my life! What should I tell people? How do I inquire about benefits? How do I ask for flexibilty? I still struggle with future plans. And I don't have answers to any of the above questions, because right now, they don't apply to me. I can only concern myself with what is happening in the here and now. Instead, I worry if the current economic situation will pull my insurance provider down, thus cutting my income in half. I wonder if Jason should leave his current job, causing us to loose our health benefits. For me, that is the here and now...and so is filling my days with meaningful actions and relationships. So how will I go about enjoying the here and now? I think that I know the secret - live honestly, live true - BIG AND GENUINE. Disclosure on a level that you need for you...not what other people need from you. Disclosure for empowerment, not excuses.